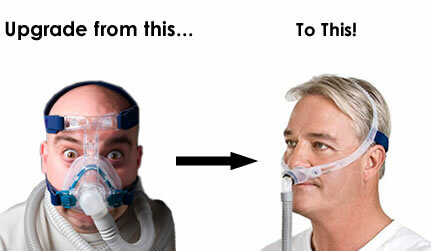 Save up to $75 on a replacement cpap mask now! Can’t sleep because your CPAP mask leaks or is too tight? Save up to $75 Now! Have you had your mask so long that it’s almost a living organism? Then maybe it’s time for you to upgrade your CPAP mask? Internet pricing with local support and service. Call today – 1-888-310-1444 – and mention our ‘CPAP Replacement Promotion’ or fill out this simple form and someone will contact you shortly. Yes, I would like more information about upgrading to a new CPAP mask. If your ready for a more comfortable night’s sleep then contact us now and learn more. Speak to a CPAP mask specialist today about our special limited offer to upgrade to a new, more comfortable mask and save up to $75. We’re standing by to answer all you questions and get you on your way to a smarter approach to apnea therapy. MedPro Respiratory Care strongly recommends individuals newly diagnosed with sleep apnea engage the services of a trained sleep clinician before purchasing a CPAP device. This program is not extended to individuals requiring a no charge trial introduction to CPAP therapy with support from a MedPro sleep clinician and is targeted specifically to individuals currently on CPAP therapy wishing to upgrade their CPAP machine or CPAP mask to ensure ongoing optimum success with therapy. Some limitations apply. Call for details.